Manipur Revenue Minister Karam Shyam said that it is only when we public realize the importance of our own individual responsibilities and entitled rights, the State will march on the road to development. 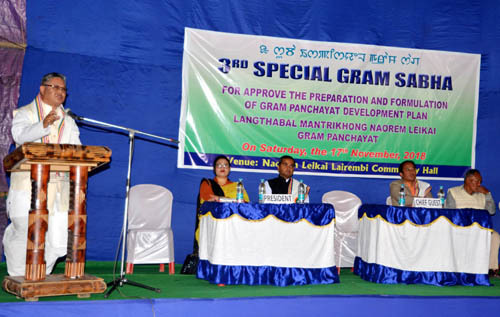 Minister Shyam was speaking at the third Special Gram Sabha Meeting of Langthabal Mantrikhong Naorem Leikai held at Singjamei Naorem Leikai Community Hall in Imphal on Saturday. The meeting was organized to ensure the general public know their basic rights and responsibilities besides giving maximum participation to avail the benefits of the Government schemes besides approving the preparation and formulation of Gram Panchayat Development Plan. Pradhan, Langthabal Mantrikhong Naorem Leikai Gram Panchayat, Aheibam Sunanda Devi; Zilla Parishad Member, Imphal West Zilla Parishad, L Roshan Singh; father Catholic School Canchipur, Reverent father Soni Thomas; Ex- Zilla Parishad Member, Imphal West Zilla Parishad,L Birenyaima Singh and Up-Pradhan , Langthabal Mantrikhong Naorem Leikai Gram Panchayat,K Sanajaoba Singh attended the meeting. Continuing his speech, shyam also said that the public should be aware of their rights in connection with NFSA, job cards, water supply, local area development funds, roads & transport matter and address their grievances to the Government freely in a democratic way. He announced that there will be a meeting on December 4, 2018 at DC Office, Imphal West to discuss revenue matter and lay down strict guidelines & instructions in connection with land demarcation according to the laws of the land. There are around 1800 job cards for this Gram Sabha area comprising of 5100 voters. Out of Rs 3 crores budget allocated for local area development funds, Rs 45 lakhs have been put into for construction of 30 houses of the Kendra and Rs 10 lakhs have been used for completing the Dr Kamal Complex, minister informed. For undertaking the welfare activities of Chajing Awang Leikai, Rs 16 lakhs have been invested and around Rs 22 lakhs used for the religious pursuits of Karam Holy shrine, he added. Ex- Zilla Parishad Member L Birenyaima of , Imphal West Zilla Parishad appealed to the public to read Government publications for beneficial schemes like NREGA & others to keep themselves updated. Drawing attention of Minister Shyam on the vagaries and problems of both floods and drought on the adjoining paddy fields located north of Manipur University, Lourembam Ibobi Singh, a local from among the audience informed that the field needs to be looked into with proper consideration. Members of the Gram Panchayat and locals of the Langthabal constituency also took part in the discussion.